Tropical rainforests are areas of dense vegetation and trees. When you think of the "jungle" you are really thinking of the tropical rainforest. 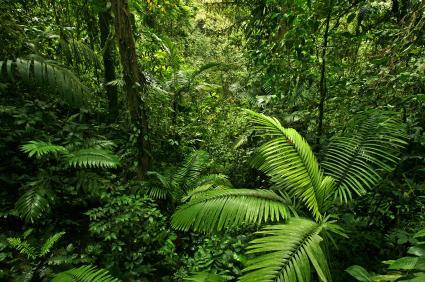 Because tropical rainforests are located close to the Earth's equator they are warm and humid places. The rainforest plants and trees also contribute to the amount of humidity because the plants give off a lot of water through transpiration. During transpiration plants (apkmonk) lose water through their leaves, stems, and flowers. The warmth and very high humidity leads to very heavy rainfall - usually over 100 inches per year, with some rainforest locations getting over 300 inches per year! The tropical rainforests are warm, but not strikingly hot (although the humidity might make it feel that way). Because tropical rainforest are close to the equator there are not changing seasons like you find in more temperate zones. It is generally always warm there year round. Also, the length of the days and nights doesn't vary with the season either. In addition, the sun is very strong there, although it doesn't penetrate to the rainforest floor too well because of the dense vegetation that it must pass through. The animals and plants that live in each tropical rainforest evolved so that they are well adapted to living in their environment. However, the flora and fauna of each rainforest evolved differently and so you'll find different animal species living in each of the different rainforest locations of the world. The map above shows both the tropical and temperate rainforests in green. All of the rainforests support a wide diversity of animal and plant life, however, the tropical rainforests are home to more plants and animals than the temperate rainforests. Although the tropical rainforests only constitute a small portion of the Earth, they are home to more animal and plant species than anywhere else on Earth. Rainforestfauna.com is a brand new site about the animals, plants, and biotopes of the rainforest. We are constantly updating our site, adding new rainforest articles and photos of the plants and animals that inhabit the Earth's rainforest. Currently our site focuses more on the animal and plant species found in the South American rainforest, but soon we will be expanding to include animal and plant profiles of the other rainforests. It is our hope that you enjoy our site and come to further appreciate the life that inhabits the rainforest. We hope that this appreciation will lead to better consumer choices for our environment, such as buying organic products and sustainable harvest products from the rainforest. Copyright © 2009-2018 RainforestFauna.com All rights reserved. Rainforest map image By Ville Koistinen (User:Vzb83) (Image:Vegetation.png) [GFDL (http://www.gnu.org/copyleft/fdl.html), CC-BY-SA-3.0 (http://creativecommons.org/licenses/by-sa/3.0/) or CC BY-SA 2.5-2.0-1.0 (http://creativecommons.org/licenses/by-sa/2.5-2.0-1.0)], via Wikimedia Commons from Wikimedia Commons and published under the the Attribution-ShareAlike 3.0 Unported (CC BY-SA 3.0) License. Image has been resized. Frog Favicon by Gina Mikel. Photos may not be copied from this site.